I don’t understand when people don’t like sweets. If someone says that to me, I immediately have my suspicions of them as a person. Is he or she an alien? I should try to be more understanding, but really, it kind of freaks me out. Up next to cupcakes, Swedish Creme from New Seasons Market, and anything from Pix Patisserie, candy bars are one of my favorite ways to satiate my sweet tooth. Chocolate, nuts, caramel, nougat…any combination is good with me. It’s so darn accessible and, while I cringe to say it out loud, candy really got me through some of the rougher days of pregnancy. And life in general. A while back, Jess whipped up some homemade Snickers bars that were divine. After tasting those, I realized how bland most brand name candy is. Still good in a pinch, but not something that can truly be savored and enjoyed. Since then, I’ve wanted to try my hand at another homemade candy bar. I finally got the time to do so a couple of weeks ago. 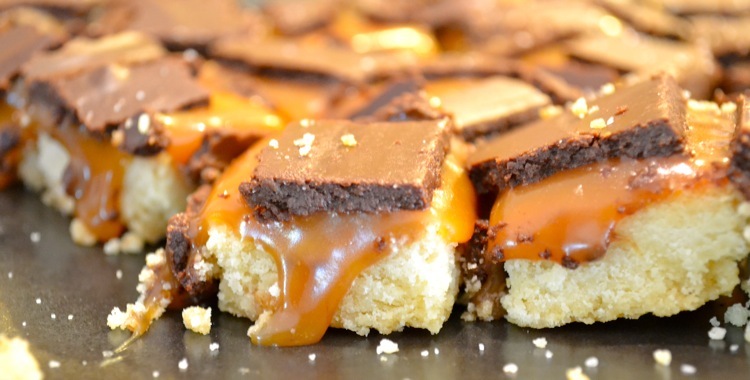 What could seem better than homemade shortbread + homemade caramel + chocolate? The answer is nothing. So I picked Twix. The shortbread is crazy, crazy, crazy delicious. I plan on using the recipe to make shortbread anything in the future. The caramel is incredibly tasty, albiet a bit on the runny side. If I make these again, I might sub in a thicker caramel recipe for this saucy one. Adding a touch of finishing salt to the top of the bars really brought out all of the flavors. These were so good, they were almost too good. 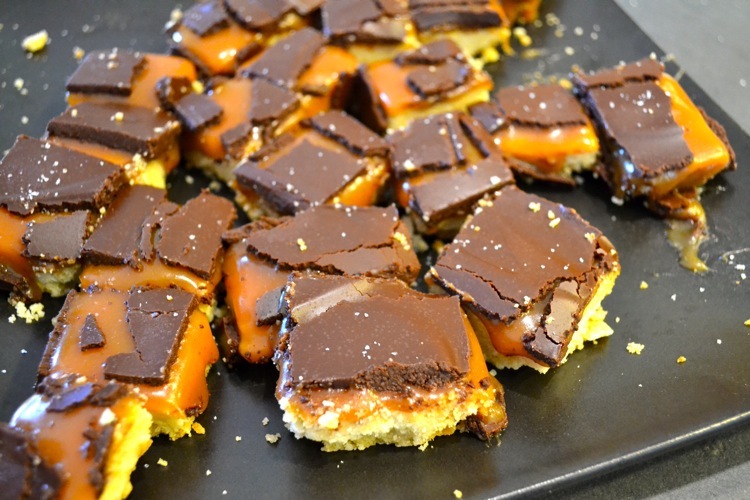 I loved the shortbread-caramel combination so much that I might nix the chocolate next time. I know; it won’t be much of a Twix bar, but it will be freakygood. Maybe some nuts would be a nice chocolate replacement. Any suggestions on the next candy bar made-at-home adventure?